The hulking old snapping turtle stood its ground on the stony beach of the riverside. It glared balefully at the four cubs and two wolves who surrounded it, then stretched out its wedge-shaped head on its serpentine neck and opened its jaw. It hissed at them all with enough venom to keep even Splash and Muddypaws at bay for several long, tense moments. Otter poked at the turtle�s shell with his fishing spear. �I like turtle soup,� he said, with a wolfish gleam in his eye. Splash inched forward to sniff at the turtle�s tail. The ridged tail curled away around the creature�s clawed hind feet, and the turtle snaked its head around with a sucking hiss. Splash retreated a step, ears down with uncertainty. Otter tapped his spear against the turtle�s shell again. �Don�t tease it,� Fadestar told Otter, from the safety of Muddypaw�s back. �It�s a whole lot of turtle soup!� Otter retorted. �I�m the one who�s hungry,� Otter said. He rapped his spear against the turtle�s shell, hard this time. Splash inched forward again to sniff the turtle�s hind end, then retreated at the turtle�s grumbling hiss. �It�s a tuuurrr-tle,� Otter said disparagingly, poking it again with his spear, so that the creature turned one eye on him directly and widened its gaping jaws even further, as though threatening to swallow Otter whole. The other three children looked eagerly. �What? What is it?� Crackle demanded. �See those scars on its shell? That�s Old Snapper!� Fadestar exclaimed. �You heard the story about how Old Snapper crippled Dagger?� Fadestar said to Newt, pointedly. �I haven�t heard it!� said Crackle and Otter in unison. Newt grinned and nodded to Fadestar, letting her do the telling. Otter stared at Fadestar with his mouth hanging open, while Crackle had twisted around and sat with one knee across Muddypaw�s shoulders to balance herself as she gazed at Fadestar in fascination. �What happened?� Crackle asked. �Warn them of what?� Otter asked. He tapped the turtle�s shell again with his spear, and the big turtle hissed like steam erupting from a geyser and took a step forward, powerful jaws wide agape. Muddypaws and Splash both shrank back a step, and Newt was quick to follow. �It was terrible! It was bloody!� supplied Newt with barely-contained glee. Otter and Crackle were both all eyes. �What happened to Dagger?� Crackle asked breathlessly. �Horrible. Just horrible!� Newt echoed, clutching his arms around himself. Fadestar paused for breath. �What happened?� Crackle prompted her breathlessly, while Otter gave Old Snapper�s shell another solid rap. The ancient turtle rumbled in low warning and wriggled its tongue. �Horrible!� Newt echoed with enthusiasm. Crackle turned on Muddypaw�s back to watch the old snapping turtle with fresh respect. Otter scowled. �You made all of that up, didn�t you?� he asked Fadestar suspiciously. Fadestar grinned back at him but didn�t say a thing, while Newt covered his mouth with both hands to hold back a giggle. Otter snorted, frustrated at himself for having been sucked into Fadestar�s tall-tale. He jabbed his spear hard at Old Snapper�s shell. To his shock, the old turtle�s neck swung around, as quick as any striking snowmouth snake. There was a sharp crack! as the turtle�s jaws snapped shut on the shear shaft just behind the spearhead � snapped it like a twig. Otter cried out in shock, and even then wolves flinched away in retreat. �Old Snapper wants your foot now,� Newt teased Otter. Old Snapper began to push himself forward across the rocky rivershore, his gaping jaws aimed at Otter. Otter took one step back, then two � then scrambled all the way up the riverbank, well out of range of those powerful jaws. �The rest of you can just stay there and play with an old turtle if you want,� the boy said archly, as if he had not just fled the scene. �I have better things to do, and I�m going to go and do them!� Otter whistled for Splash, and headed back home at a trot. 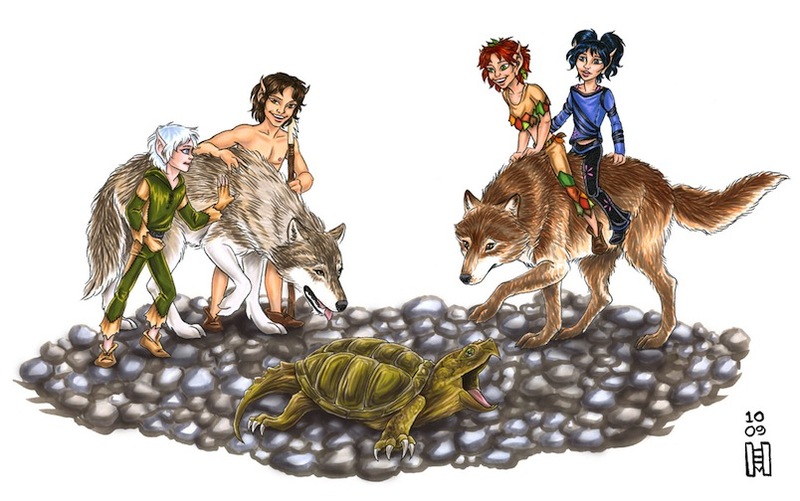 The other three children and Muddypaws climbed up the clay bank after their companion; Newt and Fadestar were trading a laughing glance, while Crackle kept a diligent eye on the hissing old turtle behind them, making sure it was not following after them. Having finally run off its tormentors, the hulking old snapping turtle glared balefully after the retreating elf cubs. Then the serpentine neck relaxed and the wedge-shaped head angled to get a better view at the shore at its feet. The old turtle went back to poking among the rocks for tidbits to eat, securely in possession of his riverside kingdom again.